← Five great ideas to do with your dog on wintery days – Like today! 1. Act like they are not worthy and grovel in front of the dog. Curling themselves into a little ball and crawling around in low circles (please don’t kill me, I mean you no harm!). But watch out, these guys are smart little critters. What they’re really doing is testing the waters to see how the adult dog will react to them! OH yes, they’re smart! 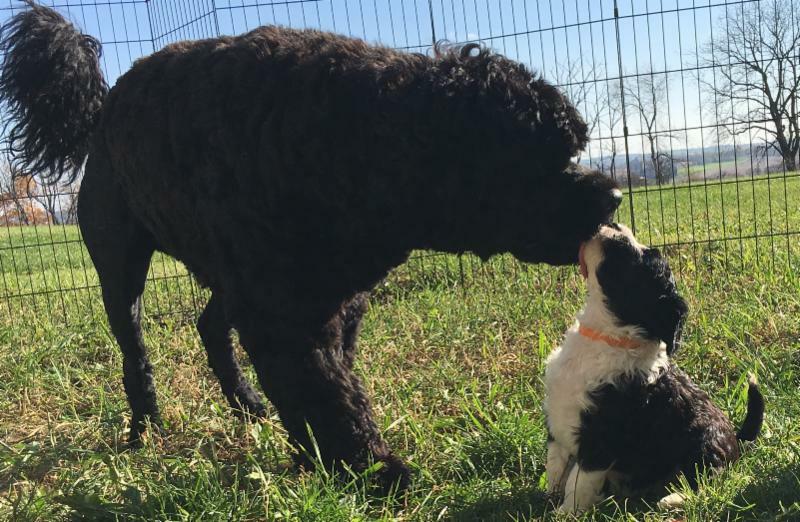 Giene Keyes, CPDT – KA Owner & Founder of Dog Face, LLC & Shooting Star Portuguese Water Dogs Giene started working with dog behavior in 1990 when she adopted a 4-year old Greyhound from the racing track. To date he is the most severe separation anxiety case that she has seen. He taught Giene about the psyche and learning process of dogs. It wasn’t until Giene was training her little pot-bellied Labrador puppy in 1995 that she really became interested in the actual training process of canines. Starting her small training business in 1997 she developed her own methods and ideas of positive reinforcement. She took what she had learned from her Greyhound, as well as positive methods she used to train horses, to create what is now the base of our training methods in the classes we teach today. 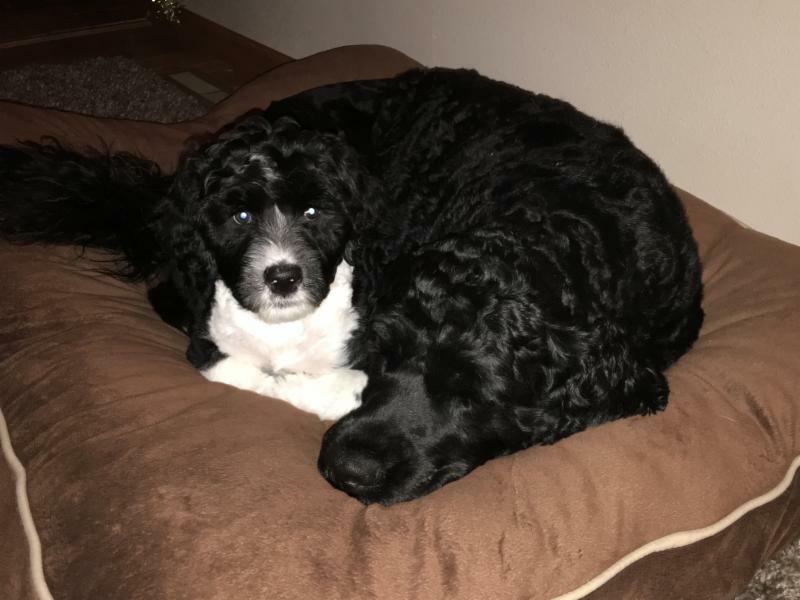 Giene is a professional dog trainer and behavior specialist in Southern Wisconsin. After winning Best of Madison for two years in a row, Giene sold her Madison Dog Daycare to devote her time to dog behavior and helping owners create harmony with their pets in their homes. Specializing in aggression and difficult dog cases, Giene also works with rescue groups and shelters, evaluating dogs for adoption, developing Canine Aggression Management programs, and educating staff on dog language and behaviors. She has provided behavior consultations for service dog organizations, rescue groups and dog daycares throughout the Midwest. She is often contacted by police departments to work with individuals that have dangerous dogs. As a mother of 3 young children, Giene also realizes the importance of family dog training. She incorporates realistic training methods and helps to incorporate dogs into the family. She is an Instructor with the American Red Cross in Pet CPR and First Aid, a Certified Canine Good Citizen Evaluator with the American Kennel Club, and a Licensed Judge with the WI Dept of Ag, Trade & Consumer Protection. Giene routinely presents seminars on Dog Behavior, Training, and Operant Conditioning as well as educating her staff on dog body language and pack mentality. Giene is a member of the Association of Pet Dog Trainers and is a Certified Pet Dog Trainer. Giene has been a regular guest on popular Madison radio shows and interviewed on numerous evening newscasts. Giene has also been featured in a number of local magazines, including the cover for Wisconsin Woman in 2010. Giene has also been highlighted in the Wisconsin State Journal for her work with Chicken Clicker Training, improving dog training skills along with timing and observation, and recently interviewed for a Nationwide Podcast. She enjoys holding training workshops across the state. If you would like to learn more about Giene, Dog Face and the services they offer, please go to the Dog Face web site at www.DogFacePet.com. 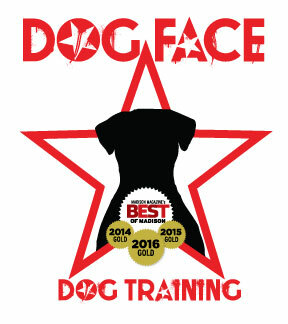 Please feel free to contact Giene of any member of the Dog Face Behavior Team anytime! Five great ideas to do with your dog on wintery days – Like today!